So I did roast a double batch of tomatoes. The cauldron (er...the dutch oven) did bubble just a little. And if you imagine my electric oven to be the fire, then yeah, it was burning pretty much all day. 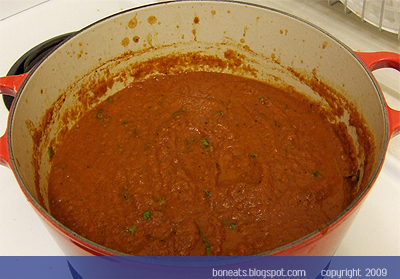 But this tomato sauce is anything but toil and trouble, and thank goodness for that! I went to St. Jacobs' Farmers' Market last week (just outside of Waterloo). I used to love going to that market--it is always bustling with people, there is loads of beautiful fresh produce available for a cheap price, and the fact that it's out in the open and practically out in the countryside makes the atmosphere that much more charming. But ever since my brother graduated from university and left Waterloo for bigger and better things, I haven't had the chance to go back until now. It's still as I remembered it, and still just as bustling, even on a weekday. I used to always watch others haul around large sacks of tomatoes and peppers from the market. St. Jacobs' likes to sell things by the bushel, any home canners' and preservers' dream. So I thought, "What the heck, why don't I buy a bushel of tomatoes myself? Make some tomato sauce. In my teeny, tiny closet of a kitchen..."
I found this wonderful Slow-Roasted Tomato Sauce recipe over at Cuizoo, and I knew they were just calling out to my own plum tomatoes. 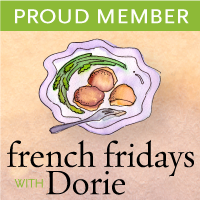 Best of all, it required minimal work: no blanching, no peeling, and no seeding! Three steps saved--and those steps are usually the most painful process of making tomato sauce. 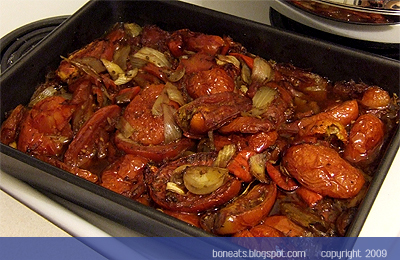 By slow roasting them, you also allow the sugar in the tomatoes to caramelize, creating a richer, sweeter flavour. It may seem like a long time in the oven, but trust me, all you have to do is cut up the tomatoes and other vegetables, stick it in the oven, and sit back and relax while the tomatoes do their magic. Tomato sauce has never been this easy. 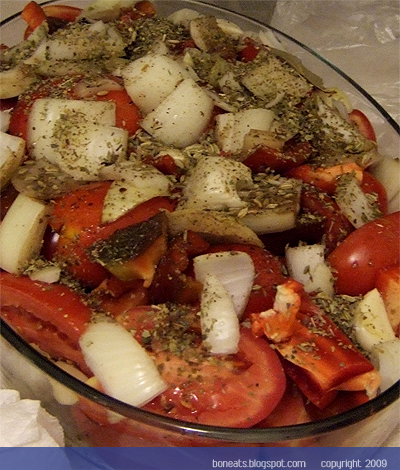 The smell that is created from the tomatoes, onions, garlic, oregano and balsamic is absolutely divine! And when they come out of the oven, they are so soft and ready to be pureed into some fabulous sauce. Once pureed and back in the pot, add a good slug of red wine and any other herbs and additions you'd like (ground meat, meatballs, red chilli flakes, mushrooms, etc.). It's a little sweeter than your usual tomato sauce you'd find in a can or a jar, but the flavours will blow you out of this world. If you prefer your sauce on the acidic side though, perk it up with a little lemon juice, red wine vinegar or balsamic vinegar. Enjoy immediately with some pasta, and can or freeze the rest for later in the winter! With the abundance of tomatoes I brought home, I still had lots leftover to make some soup. I apparently didn't get enough roasting action yesterday so I roasted some more today to make a Roasted Tomato Soup, served alongside a grilled cheese and tomato sandwich. A classic combination, and perfect for welcoming the first day of autumn. Preheat the oven to 350°F. Spread the tomatoes, skin side down, in one layer in a roasting pan, add the garlic. Drizzle with a little olive oil and season with salt and pepper. Bake the tomatoes and garlic for 45 minutes to 1 hour, or until the tomatoes are very soft and their skin is dark brown and blistered. Let the tomatoes and garlic cool a little in the pans. Heat some olive oil in a heavy saucepan over medium heat. Cook the shallot, oregano and thyme, stirring, until the shallot is soft. Add the tomatoes, garlic (skins discarded), bay leaf, and 1 1/2 cups of the broth. Season with salt and pepper, and simmer the mixture, covered, for 15 minutes. Remove the bay leaf. In a blender, puree the soup in batches until very smooth. Force pureed mixture through a fine sieve set over the clean saucepan. If soup appears a little thick, thin it out with some broth. Add the honey (if needed), stir in the basil, and season again with salt and pepper if required. Serve hot sprinkled with some freshly grated parmiggiano-reggiano. 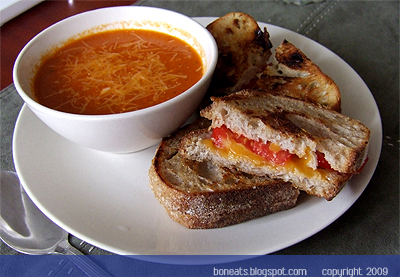 ** NB: I find the honey helps cut back on the acidity of the tomatoes, giving for a much smoother taste overall. 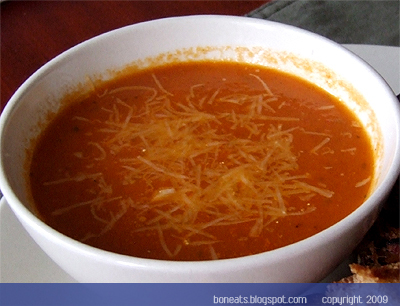 You may find that honey is unnecessary if you have extra sweet tomatoes, so be sure to taste the soup before deciding whether it is needed or not. Alternatively, you can add a dash of cream, which will also help mellow out the acidity. Posted by Bonita at 8:00 p.m.